Their flagship red wine shows restrained aromas of pencil shavings, spices and cassis. A seemless balance between fruit purity and tannin austerity with a medium acidity. 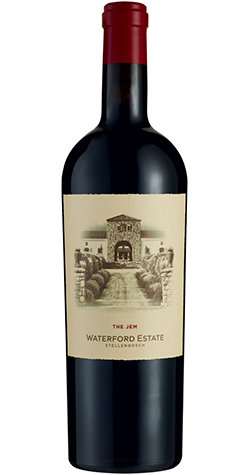 Intriguing aromatics of fresh fruit, wild spice, warmth and complexity complimented by the well layered and integrated tannins to offer an elegant yet long lasting finish that is classically dry and rewarding. Waterford Estate is situated in one of the world's most visually arresting pockets of paradise. Nestled in the picturesque Blaauwklippen Valley, in the world-renowned Stellenbosch region, this 120-hectare property boasts ancient citrus groves, rolling lawns, water features and fragrant lavender beds. * NOTE: This bottle comes with special packaging and may have to ship separately. This may incur additional shipping costs.